Income Tax Refund (ITR) Refund Fraud: Income Tax department is taking several preventive measures to ensure secure accounts of tax payers. But, it has come to light that some fraudsters are sending fake messages, phishing and suspicious e-mails to dupe tax payers in the name of income tax refund. 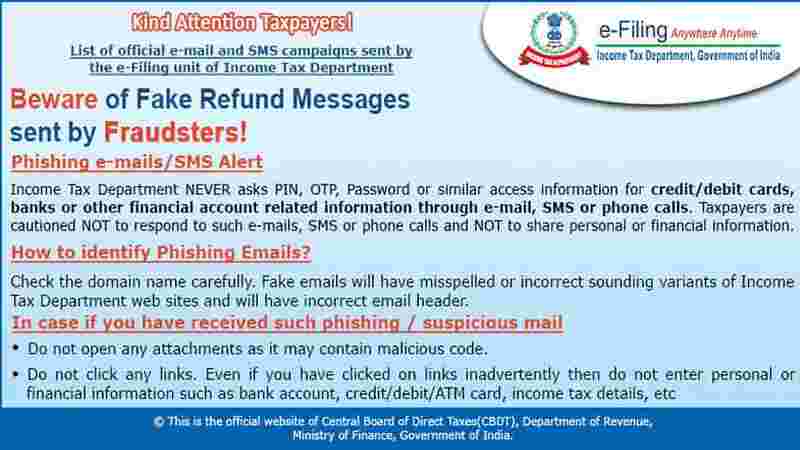 To make tax payers aware of how to spot such fraudulent SMSes, e-mails etc., the Income Tax department has come up with some advices. It is believed that if a tax payer adopt these practices, he/she may avoid a big financial trouble and can save the hard-earned money. – Income Tax department NEVER asks PIN, OTP, Password or similar access information for credit /debit cards, banks or other financial account related information through e-mail, SMS or phone calls. – Tax payers are cautioned NOT to respond to such e-mails, SMS or phone calls and NOT to share personal or financial information. Check the domain name carefully. Fake emails will gave a misspelled or incorrect sounding variants of Income Tax Department websites and will have incoorrect email header. What to do in case you have received such phishing/suspicious mail? – DO NOT OPEN any attachments as it may contain malicious code. – DO NOT CLICK any links. Even if you have clicked on links inadvertently then DO NOT enter personal or financial information such as bank account, credit/debit/ATM card, Income Tax details, etc. By following the advisory by means of above-mentioned points, one can avoid falling into the trap of fraudsters, and save his/her money. PREVIOUS POST Previous post: How to register to vote in India?